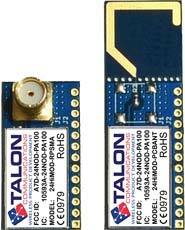 Talon's high performance certified modules enable you to quickly design in wireless functionality without having RF expertise. Our RF modules will help get your product to market quickly, cost effectively and with minimal headache. NEW for 2015! Oasis Thread / SE2.0 Radio Module. These top of the line high power Thread / ZigBee 802.15.4 modules are targeted at the most demanding ZigBee Smart Energy SE1.x and SE2.0 / Thread IoT applications and other IEEE 802.15.4 systems requiring secure and robust long range communications indoors or out. The Oasis is available on 5 different Development Platforms: Arduino Uno (Threaduino), Freescale Tower and Freedom Boards, Sierra Wireless mangOH and TWRPI. See the Oasis Brief for more information. Hi MOD The Hi MOD radio module offers a unique combination of high power and high data rate. Typical applications include gaming and long range asset tracking. This module is used in the Classroom Edition Dance Dance Revolution and other volume applications. Coming Soon Check back for other radio modules to be released soon!